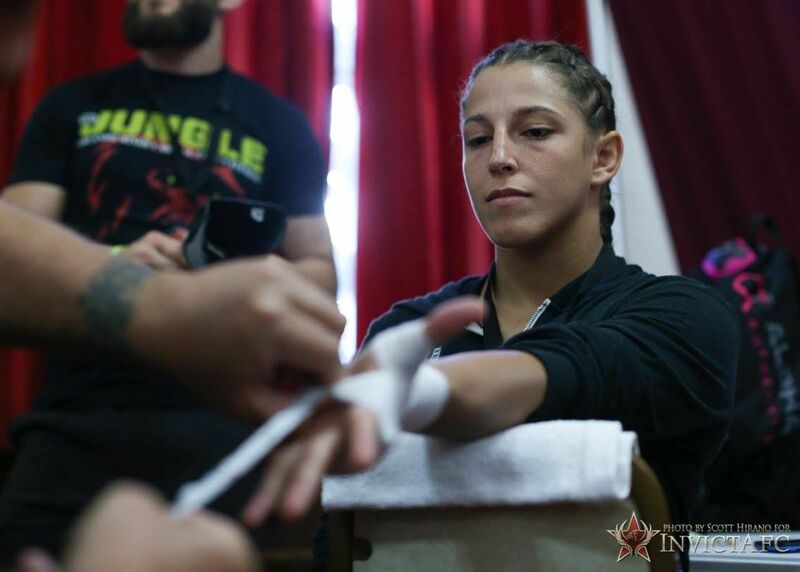 Felicia Spencer prepares for her fight against Helena Kolesnyk at Invicta 30. MMA fighter Felicia Spencer poses post-fight with trainers Mike Lee, right, and Seth Petruzelli. Newly-signed UFC fighter Felicia Spencer connects on a kick against Amy Coleman in an Invicta FC fight, which she won by submission. As Felicia Spencer prepared for her featherweight title fight with the Invicta Fighting Championship, she knew there was more than just a title on the line. With an unblemished record, there was a more than likely chance that if she beat Pam Sorenson and raised the belt, she would get a chance to sign with the UFC. That has always been the dream for the former Lemon Bay High graduate. 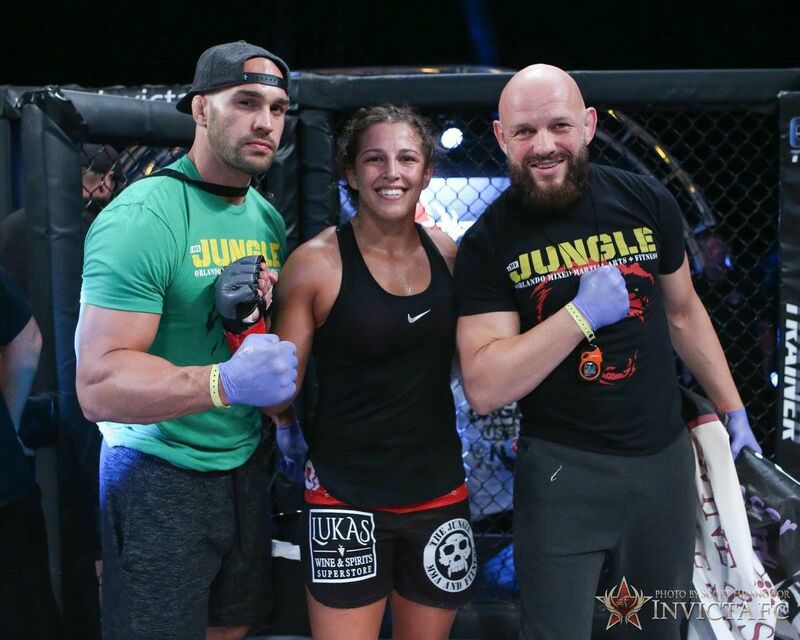 A few weeks ago, after a win by submission over Sorenson back in November, that dream came to fruition as Spencer signed her contract to fight in the UFC, the premier MMA organization. “It’s kind of unreal,” Spencer said. “It sinks in little by little. It all kind of came together. There was a couple weeks in between me knowing and everyone else around me knowing. Once they knew, it was a whole new feeling of craziness. Spencer was part of a host of women signed to bolster the 145-pound featherweight division. Though she’s new to the UFC, there’s no lack of confidence. Whether she fights her fellow newcomers or is thrown in with veteran fighters, she’s itching to prove herself. Shannon Knapp, the owner of Invicta FC, was instrumental in Spencer’s ascent in the sport. Working closely with the UFC, Knapp helps fighters rise through the ranks with Invicta. Once the UFC came calling for Spencer, Invicta released her from her contract so she could continue to the next level. Heading into the Invicta title fight, Spencer tried not to focus on the potential signing that awaited if she left the cage victorious. She was aware of it, but didn’t want her long-term dream to become a short-term distraction. Going four rounds and winning by rear naked choke, she improved her record to 6-0 in her pro career and laid the groundwork for a UFC climb. It’s been a winding road for the 28-year-old fighter. A Canadian native who moved to Englewood as a child, Spencer began training in Taekwondo at age 4 and Brazilian Ju Jitsu at 12. Now training out of The Jungle in Orlando, Spencer presents a well-rounded fighting style that Lee expects will give UFC fighters fits when put up against her. Superior striking ability paired with solid grappling, Spencer possesses a different composition that is unlike many fighters. The UFC featherweight division that will soon feature Spencer was built as Cris Cyborg quickly became a phenom during her run. But the series hasn’t been able to properly fill the roster with fighters until recently. They are looking to change that with the signing of fighters like Spencer. She sees this as her shot to take the next step toward becoming a UFC champion, not just for herself, but to prove to the MMA community that the featherweight class belongs. “This is my perfect opportunity to start from the ground and help the world see my division as legitimate with legitimate skills,” Spencer said. “It’s a big platform. Everyone knows what the UFC is. There is a lot of pressure on performance to prove the legitimacy of my weight class. A lot of people have dismissed it as not being full of skilled athletes.